Your Donation makes a difference in our community! 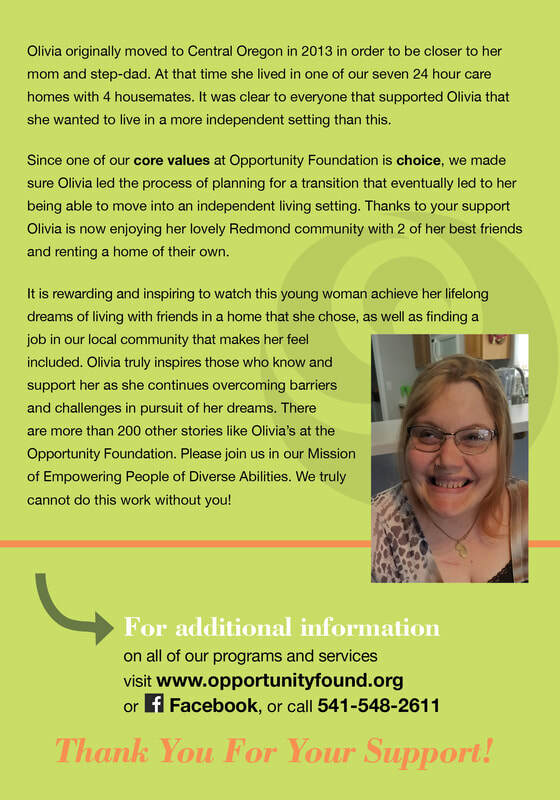 The work of Opportunity Foundation makes a tremendous difference to our supported individuals, to their families and to the community. 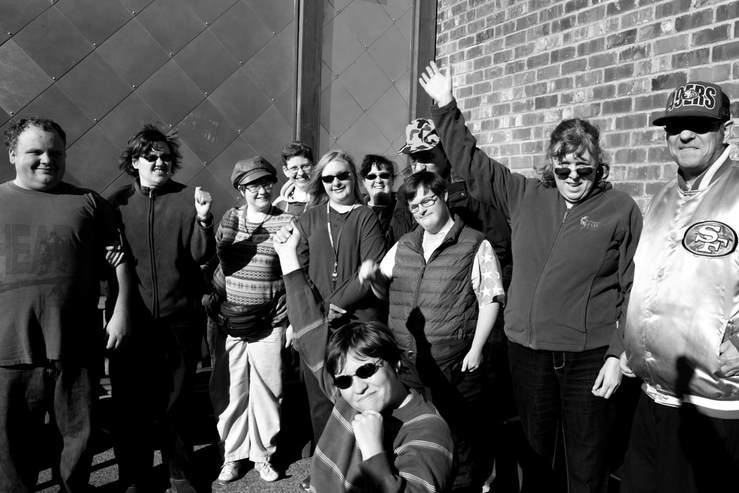 Your donation helps us continue to provide programs and services for individuals with disabilities in Central Oregon with fulfilling jobs, safe, loving homes, life skills training, and therapeutic support. In fact, nearly 90% of all donations directly support and grow our programs and services. 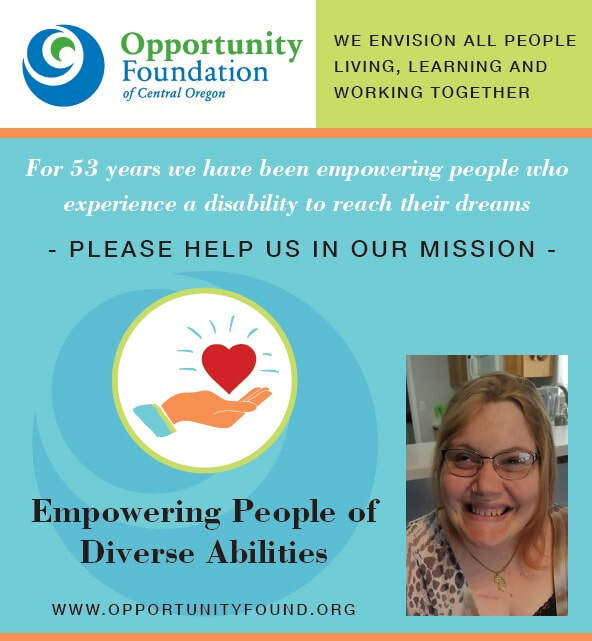 On behalf of everyone at Opportunity Foundation, thank you for your generosity! Thanks so much for being involved in and advocating for our work. We are so grateful for your continued support and generosity! We’ve recently partnered with a program called the RoundUp App that allows you to “round up” the change from your debit or credit card purchases and donate it to us monthly. Take a look at this 90 second video that explains how it works. This is a way for you to empower people of diverse abilities just by donating your change. It’s small change for you but truly a game changer for us, so we would be honored if you would commit to give in this way. You can download the app for iPhone, Android or create an account on the Web. Sign up with Amazon Smile or Fred Meyer to donate at no cost to you! Do you have an Amazon account? Did you know that you can support our mission every time you shop there, at NO COST TO YOU? AmazonSmile is a way for customers to support their favorite non-profits every time they shop with Amazon! Shoppers who start at smile.amazon.com will find the same Amazon they know and love, with the added bonus that Amazon will donate a portion of the price of eligible purchases to the charity of your choice.